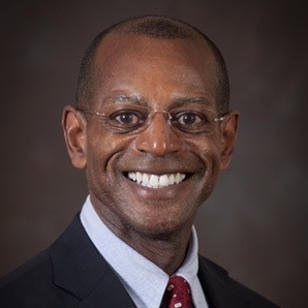 James C. Wimbush is Indiana University’s vice president for diversity, equity, and multicultural affairs; dean, The University Graduate School; and Johnson Chair for Diversity and Leadership. Under his guidance, IU’s Office of the Vice President for Diversity, Equity, and Multicultural Affairs (OVPDEMA) has prioritized the recruitment and retention of underrepresented faculty, staff, and students, and timely graduation of students, while ensuring that Indiana University maintains a learning environment where people of all backgrounds can thrive and a commitment to local and national outreach and advocacy is kept. Campus Pride’s “Best of the Best” of the top-25 LGBTQ-friendly college campus in the U.S.
IU has also established numerous diversity and inclusion initiatives that have been spearheaded by Vice President Wimbush, including the Black Philanthropy Circle, an initiative designed to foster philanthropy and provide resources for the African American community, and the First Nations Leadership Ambassadors Council, an effort to better connect to and gain insight from the Native American community. For the 2017-18 academic year, IU’s population of underrepresented minority students reached 24.1 percent, which is higher than the state of Indiana’s population of minority residents. Other significant milestones that have occurred during Vice President Wimbush’s tenure include a $1.6 million grant from the Office of Naval Research to assist in training diverse STEM researchers, in partnership with minority-serving institutions across the nation; IU’s first comprehensive diversity assessment, conducted by the independent firm Halualani & Associates that will serve as a baseline measurement and inform strategic planning efforts; and the establishment of a university-wide incident reporting system. A native of Virginia, Vice President Wimbush acquired his B.S. from Averett University and earned a master’s degree in human resources management and industrial and labor relations and a Ph.D. in management from Virginia Polytechnic Institute (Virginia Tech). Since 1991, Vice President Wimbush has been a professor of business administration in IU Bloomington’s Kelley School of Business, where he has chaired several departments and received multiple teaching awards.